Heartfelt, incisive, and timeless, The Confessions of Saint Augustine has captivated readers for more than fifteen hundred years. Retelling the story of his long struggle with faith and ultimate conversion -- the first such spiritual memoir ever recorded -- Saint Augustine traces a story of sin, regret, and redemption that is both deeply personal and, at the same time, universal.Starting with his early life, education, and youthful indiscretions, and following his ascent to influence as a teacher of rhetoric in Hippo, Rome, and Milan, Augustine is brutally honest about his proud and amibitious youth. In time, his early loves grow cold and the luster of wordly success fades, leaving him filled with a sense of inner absence, until a movement toward Christian faith takes hold, eventually leading to conversion and the flourishing of a new life. 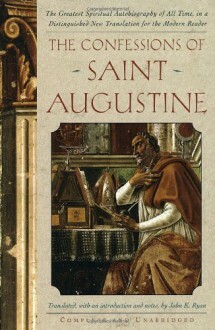 Philosophically and theologically brilliant, sincere in its feeling, and both grounded in history and strikingly contemporary in its resonance, The Confessions of Saint Augustine is a timeless class that will persist as long as humanity continues to long for meaning in life and peace of soul.